You can print anything you want on the cover including full color designs, photographs, and your college seal–ALL FOR FREE! It’s perfect for theses, dissertations, genealogies, yearbooks, photo books, and more. To make your Printed Hardcover, we simply take your approved design*, print it on our high-quality digital printers, and laminate the print, then use it to make the cover instead of fabric. You can design your own cover and send us your file, or we can provide basic designs for you. This example of a customer-created cover has a wrap-around full color design with a photograph and Vitae on the back cover. Send us your design, as elaborate and colorful as you please, and we’ll deliver your book with a completely unique cover in brilliant color. 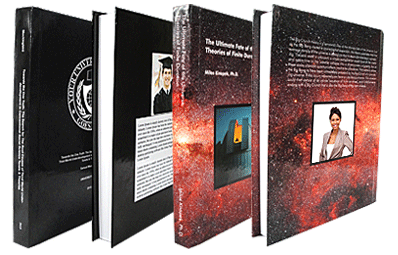 The examples below represent the basic designs we can provide for your Printed Hard Cover book. In the order process, you will have an opportunity to tell us what colors you would like, and you may supply your pictures through email.